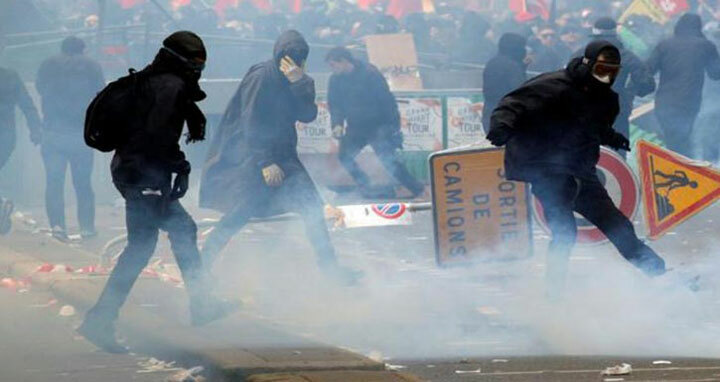 Dhaka, 2 May, Abnews: More than 100 people remained in custody in Paris Wednesday after annual May Day protests turned violent, police said. The Paris chief of police, Michel Delpuech, said 109 people were in detention on Wednesday. "It's been a long time since we saw numbers at this level," Delpuech told BFM TV Wednesday morning. French President Emmanuel Macron, on a visit to Australia, tweeted: "I firmly condemn the violence of the rogue demonstrations which took place today. We will do everything so that the perpetrators are identified and made responsible for their actions." An estimated 1,200 masked and hooded protesters dressed in black took part in the violence, Paris police said. At a news conference, officials said three people were detained for throwing projectiles and another four for carrying prohibited weapons. Some 1,500 police were deployed to the streets to protect buildings and peaceful protesters, French Interior Minister Gerard Collomb said on Twitter. "I firmly condemn the violence and attacks carried out on the sidelines of the May 1 trade union parade," he said. French President Emmanuel Macron also weighed in, saying the violent acts of some misrepresented the spirit of the parades. "Everything will be done to identify and hold those responsible for these acts," he said. Anne Hidalgo, the mayor of Paris, tweeted Tuesday that she condemned the violence "committed this afternoon in Paris by hundreds of masked individuals. Their only purpose was to sow chaos. It's horrible. All my solidarity with the store owners and residents affected as well as the demonstrators who paraded quietly for the #1May." Thousands of Parisians typically take part in the annual parade, held to mark International Workers' Day, held on May 1 and observed around the world. The rallies date back to the 1880s, when the day was adopted by Socialists and Communists of the Second International as labor movements were campaigning for better conditions such as eight hour workdays and trade unions. This year's French rallies come on the 50th anniversary of protests in Paris in May 1968, which were some of the most violent in the French capital's history. Students occupied buildings in the Sorbonne and general strikes brought the country to a standstill throughout the month and nearly toppled the government of Charles de Gaulle.